Bristol can't help itself right now, pouring out a steady stream of neon-glowing and crunk-juiced dubstep from Gemmy, Joker, Guido, Jakes and the rest in unstoppable fashion. 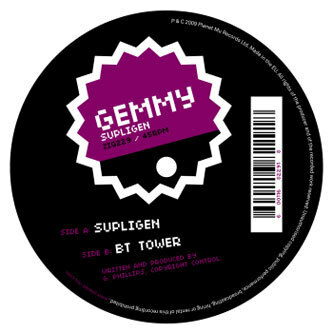 Gemmy follows up his 'Bk 2 The Future' plate for Peverelist's Punch Drunk label with 'Supligen'/'BT Tower Mast' for planet Mu, squeezing his synths until they bleed skwee style. 'Supligen' features a haunting organ refrain/synthline squeeze sounding like the Specials jamming with Dr Dre, while 'BT Tower Mast' is a tense half stepper with subliminal subbass and a squiggly mid range bite. Heavily funked and severly crunked gear that's already got support from Plastician, Joker, Rusko and RSD.